Portland Museum of Art members mingle with artists and collectors at the opening reception for the museum's Degas exhibit. 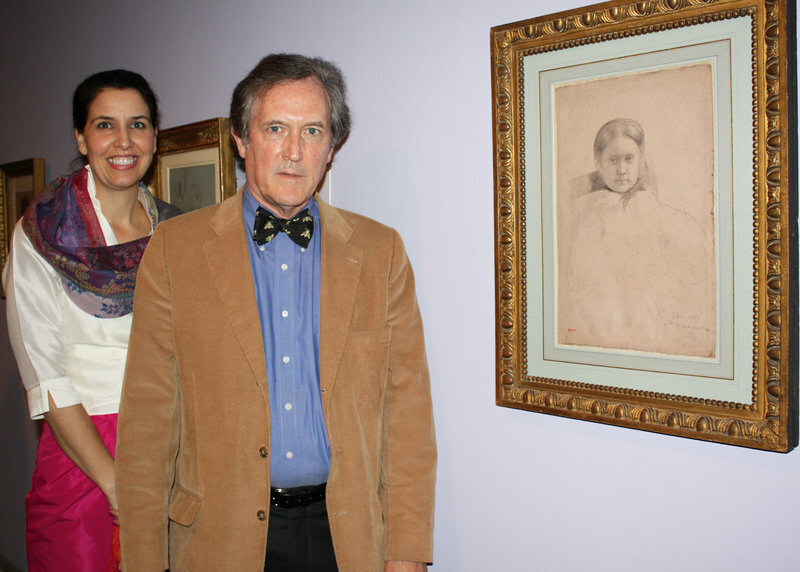 More than 350 members filled the Portland Museum of Art Wednesday night for the opening reception of “Edgar Degas: The Private Impressionist.” The exhibition, which will remain on view through May 28, offers a rare glimpse of the French master’s sketches, photographs and personal drawings. 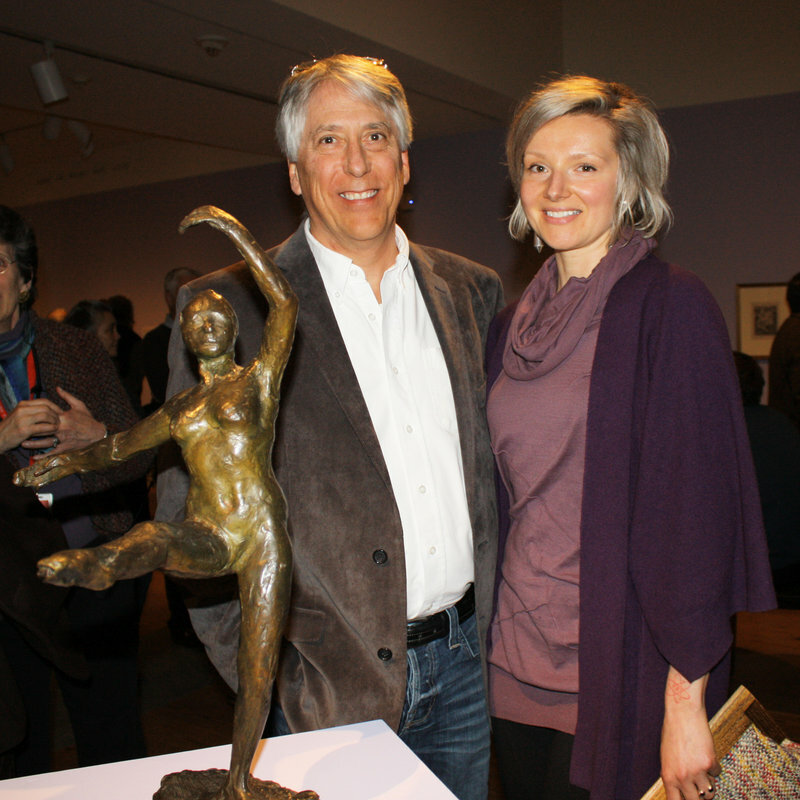 Margaret Burgess, the Portland Museum of Art’s European art curator, and collector Robert Flynn Johnson with “Mlle Dembowska” by Edgar Degas. 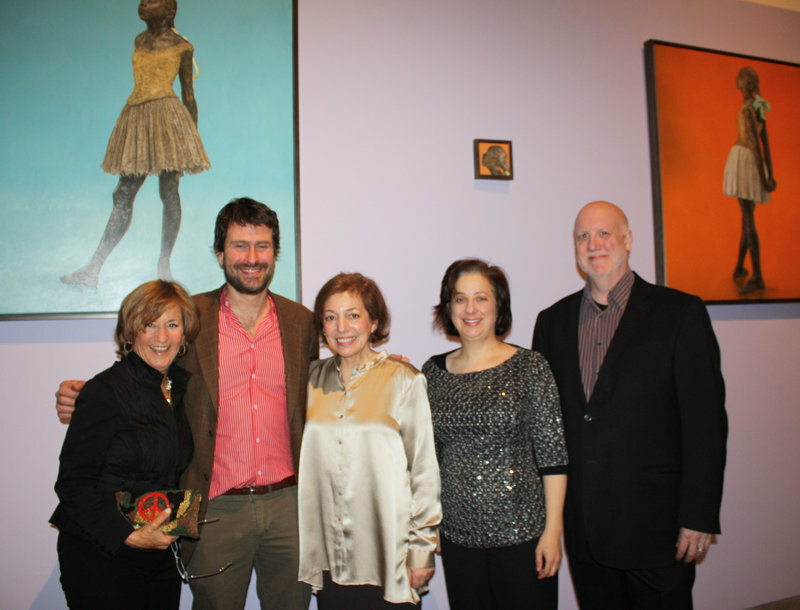 Artist Jane Sutherland, center, stands in front of her Degas-inspired paintings with Melinda Weber, Dan Sonenberg, Jennifer Elowitch and Douglas Chene. 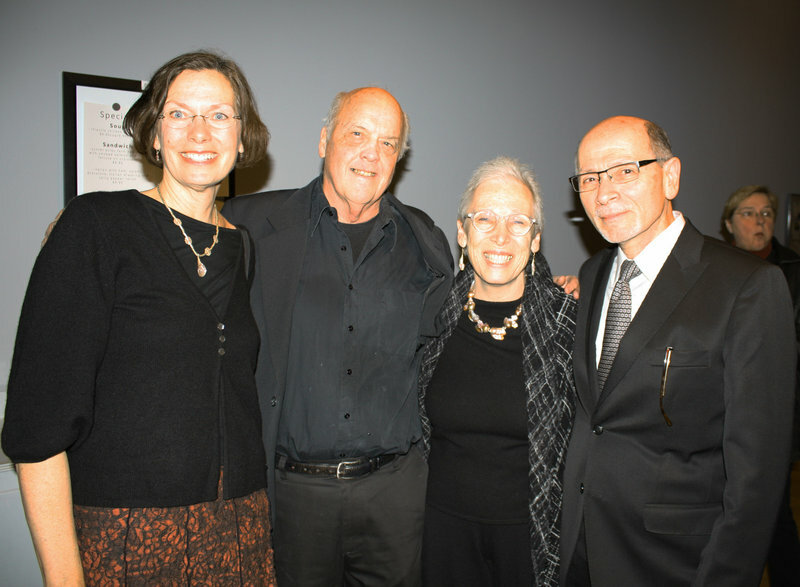 Christa Cornell of Brunswick, artist Tom Cornell, Beverly Denenberg and Stuart Denenberg, one of the individuals who organized the show. 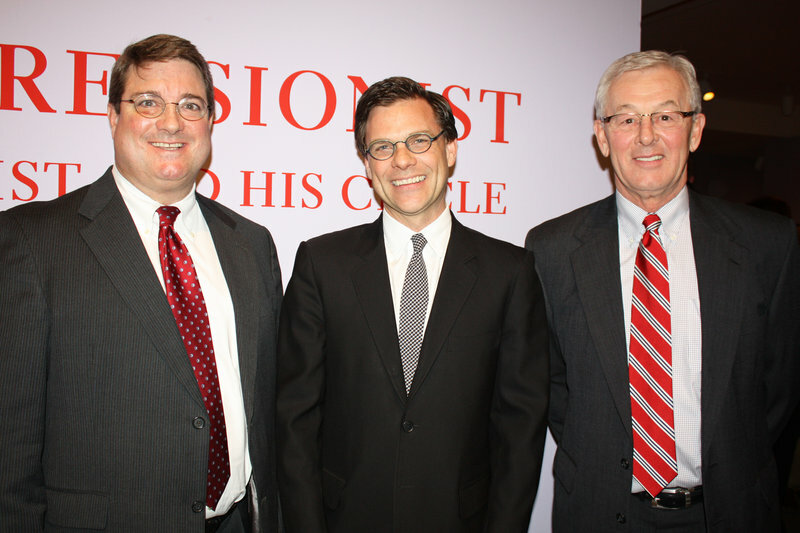 Portland Museum of Art Director Mark Bessire, center, with Tom Whelan of Bath Savings Institution, left, and Bob Moore, CEO of Dead River Co. Both companies sponsored the show. These are paired with 17 works on paper by artists who worked in Paris during the same era, and a selection of Degas works from the museum’s permanent collection and on loan from local collectors. The bulk of the show comes from the collection of Robert Flynn Johnson, who is curator emeritus of the Achenbach Foundation for Graphic Arts at the Fine Arts Museums of San Francisco. Johnson purchased his first Degas work in 1973 and has amassed a collection of 112 works. He said the show’s title refers to the fact that the works Johnson has been able to collect over the years are sketches and preparatory materials Degas created as part of his artistic process. Johnson noted that with Degas’ rising profile, he’s been priced out of the market as a collector. “But there are so many areas one can collect, such as American folk art or photography,” Johnson told me. He said before the exhibition was put together, he had roughly 25 percent of the works hanging in his home. 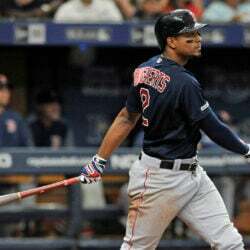 “In my dining room or bedroom, it’s hard to guess what the color of the walls are because there’s so much art,” Johnson said. The Degas show is paired with a complementary show in the Great Hall featuring paintings and drawings by contemporary artist Jane Sutherland. Five years ago, she started traveling to museums which have one of the bronze Degas statues “Little Dancer of Fourteen Years” in their collections. Sutherland has drawn this sculpture from many angles, and these works provide a modern view of the French master’s work. “I feel like (the dancer in the sculpture) wants to be the most famous dancer in the world,” Sutherland told me. One of the local collectors lending work to the show is Maine businessman Les Otten. He owns the sculpture “Fourth Position in Front on the Left Leg,” which is normally exhibited on the museum’s second floor European gallery. He went on to say that the recent spate of museum shows dedicate to Degas reflect the artist’s rising status in art historical circles. “We’re starting to see a recognition now that Degas is one of the best of the best,” Otten said. Near the start of the reception, museum Director Mark Bessire and representatives from the show’s corporate sponsors, Dead River Co. and Bath Savings Institution, spoke about the exhibition. “I think this show says a lot about the museum and the people who run this institution,” said Bob Moore, CEO of Dead River, when he addressed the large group. Tom Whelan, president of Bath Savings Trust Company, drew a historical parallel between the bank and the artist. “In 1852, when our institution was being founded, a young Degas was just beginning to talk about the arts in Paris, France,” Whelan told us. When I chatted with best friends Susan Betz of Cape Elizabeth and Lisa Barron of Freeport, both gave the show high marks.